Inequality in the developed world is the sharpest in 30 years, a recent OECD research reveals. Yet even in this context, two countries stand out in the disparity between rich and poor: the USA and Israel. Compare the average 9.6 index with the US, where the richest 10 percent of the population earn 16.5 times as much as the poorest 10 percent. The poorest citizens of Israel scrape by on one-fifteenth of the earnings of the richest 10 percent. The US also has the widest gap between the income of the richest and the average households. The top 5 percent of US households own practically 91 times the wealth of the average. The OECD report, covering the situation in 18 member nations, says half of total wealth resides in the hands of just 10 percent of population, while the next 50 percent hold almost all of the second half, leaving the remaining 40 percent with the scraps - just over 3 percent of the wealth. The record level of inequality is explained partly by a wider gap in education between the richest and poorest social groups, leading to lower quality and productivity in the workforce. Another factor that OECD considers responsible for growing inequality is the growth in what it calls non-standard work, which includes temporary contracts and self-employment. Since the mid-’90s more than half of all new jobs created in OECD countries fell into this category, according to the report. Families that rely on this type of employment are much more likely to be poor, exacerbating overall inequality. 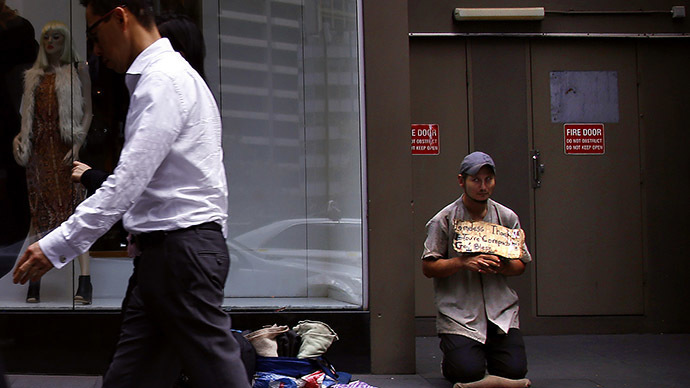 OECD experts warn that the rising level of inequality is hampering world economic growth. The report also cites increasingly less progressive tax systems and social benefits losing ground to inflation as reasons why income redistribution schemes have become less effective as of late. Instead, the study advocates a more direct system of taxation and transfer. “Redistribution via taxes and transfers is a powerful instrument to contribute to more equality and more growth,” the report says. It also mentions the increasing number of working women as one of the factors contributing to the growth in inequality. Women earn 15 per cent less than men, according to the report, which says ensuring equal pay for men and women could be one way to reduce the wealth gap. Latin America is one of the few regions where inequality hasn’t been growing in the last 30 years, despite the social gap there being initially higher, the OECD said.